Murder by Gaslight: "Handsome Little Dandy." Frank Stark (or Starke) angrily burst into the dressing room of the Vicksburg Opera-house where David R. Allan and his wife, May, were preparing to go on stage, the evening of November 14, 1883. Allan, 55 years old, was a veteran performer and the manager of the John F. Ward Comedy Company. He had recently fired Stark, age 22, from his position as advance agent for the company. The two men exchanged words then Stark drew a pistol and pointed it at Allan. May Allan grabbed the pistol from his hand and D. R. Allan thrust Stark out of the room. Stark snatched the pistol back from Mrs. Allan, and as D. R. Allan followed him into the hall, Stark turned and fired four shots at Allan. Two shots hit their target, one passing through Allan’s heart. Young Frank Stark was a well-known man about town in Vicksburg, Mississippi. He had a taste for fine clothing and was always seen with a silk hat on his head and a gold cane in his hand. The Vicksburg Evening Post described Stark as “the handsome little dandy who always looked as if he had just stepped from a bandbox, so dainty and neat was he on all occasions.” He came from a family of prominence and wealth and with both of his parents dead, Stark stood to inherit considerable property, but by the provisions of the will, he would not come into full possession of his share until his younger sister, Josephine, attained her majority. In the meantime, Frank was given an allowance of $50 a month. While this would have been a tidy sum for someone of modest tastes, Frank Stark had a passion for fast living and extravagance and associated with women who were expensively disreputable. As a result, he was constantly in need of ready cash. He used his family connections to obtain respectable employment, but his natural disinclination toward hard work prevented him from keeping any job for long. He had been a clerk at Shillito & Co. and an under clerk at the Lafayette Bank but was discharged from both positions. He worked as a traveling salesman for A. C. Schuberth the cigar dealer, but quit after one or two trips. In New York, he became an advance agent for Barlow & Wilson’s Minstrels which led to his connection with the John F. Ward Combination. Stark began carrying a revolver because he did not trust the people in the comedy company and anticipated trouble. As a diversion, Stark liked to fire the pistol out of the window of his room at night. Following his arrest for murder, Stark requested his guardian hire Cincinnati attorney T. C. Campbell. Campbell did not defend Frank Stark at his trial, but it is likely that he represented Stark at the habeas corpus hearing where, to the surprise of everyone in Vicksburg, the charge was reduced to manslaughter and bail was set at $5,000. The following month, December 1883, T. C. Campbell, who defended William Berner in Cincinnati on the charge of murder, was accused of jury tampering. When that jury returned a reduced charge of manslaughter, the city of Cincinnati responded with three days of rioting. Frank Stark’s murder trial in June 1884, lasted three days, with one full day taken up with closing arguments. The case against Stark was quite strong but his defense team, led by James Gibson, argued Stark’s plea of self-defense “with great skill and adroitness.” The people of Vicksburg were surprised once again when, after deliberating for only an hour, the jury returned a verdict of not guilty. “[Frank Stark],” Vicksburg Evening Post, April 2, 1884. “A Cowardly Murder,” National Police Gazette, December 8, 1883. 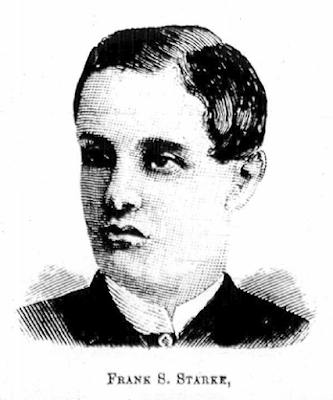 “Frank Stark,” The Clarion-Ledger, July 2, 1884. “Frank Stark in Town,” Cincinnati Commercial Tribune, December 29, 1883. “More about Frank Stark,” Vicksburg Evening Post, November 20, 1883. “A Stage Murder.,” Arkansas Gazette, November 15, 1883. “The Starke Trial,” Vicksburg Evening Post, June 28, 1884. “Vicksburg Notes,” Commercial Appeal, November 21, 1883.